My first visit to Spennymoor and it was a fine sunny day, The journey via satnav was a tad longer than just making your way through Wheatley Hill and round a few back roads - as we did on the way back. 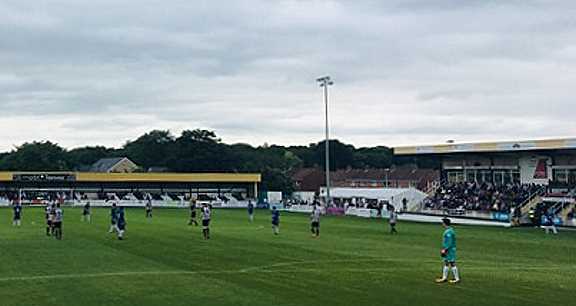 The Brewery Field is a tidy little ground with a small stand behind one goal and a reasonable-size stand on one side with the dressing rooms etc. Spenny look as if they are building a decent side and they gave us a tough game, especially in the second half. They had beaten Billingham Synthonia eleven-one last week with the little maestro David Foley, who still looks a decent player, hitting a hat trick in that game. Ok, Billingham Synthonia may be well below Billingham Town, but as we managed a draw with them I was expecting a better showing today. I stood behind the Pools goal in the first half and looking down the pitch it looked like it had a serious tilt on either side of the pitch and the goal mouth looked like a pitcher's mound in baseball. It must be hard to play up the hill in a game. I would have to say Pools played a strong side, but I am not sure if Mr. Bates knows what his strongest side is. We looked very mobile with all the lads looking for the ball and all handling the task very well. Once again Kitchen did very well, picking up the ball and doing a great job pushing us forward. We look a well balanced side and after a brief spell of pressure by the home side Pools soon set about controlling the game and cutting out any possible threat from Spennymoor. Hawkes was the first to strike and he hit a rasping shot which hit the post and bounced clear with the Spenny goalkeeper nowhere near it. Noble looks a right character, obviously enjoys a joke and plays up to the fans. He went out to the left corner flag and placed the ball just a fraction outside of the quadrant. The lino dragged it back into the quadrant so Noble picked it up and replaced the ball so that it was just off the edge of the quadrant and gave the lino a nod and sent the ball in. Davies met it with a great header and their keeper made an even better save. The ball spun up in the air and through a throng of players and as it dropped Luke James launched himself and managed to get a foot under the ball and hit it into the top of the net to give Pools the lead. In the second half, despite playing up the slope, Spenny had Pools on the back foot and the defence had to work hard to keep them at bay. Loach made a couple of decent blocks, Noble almost sewed up the game with a nice chip which again hit the woodwork with the keeper nowhere near. After a succession of subs from Pools the game got a bit laboured but Pools held out. "Spenny look as if they are building a decent side and they gave us a tough game"
Cassidy, who looked a bit belligerent, started mixing it with their centre half but he did manage to get a decent shot off, which the keeper turned round the post. There was a little afters between the centre half and Cassidy and I think the ref blew early for full time rather than take any action as the defender had been booked earlier. A decent performance from the lads and a few Pools fans said afterwards that they would like to see Spennymoor come up to Pools' division as it would be a good Derby game.